Hey, y'all! I need your help! YOU can play a major part in helping an author get published!!! Here's the deal. I need to build my email list. It's one of the most important things an author can do to get an agent's/editor's attention. To show my thanks for your support, I'm giving away a prize to one email contact randomly selected from my list! $15 Amazon or Starbucks Gift Card, your choice! 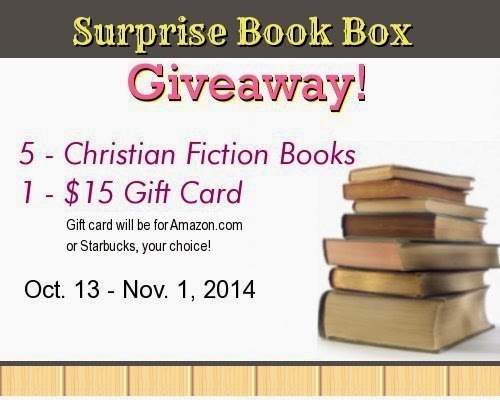 Surprise bundle of 5 Christian fiction books! Enter your email, using the form below (name optional). Tell your friends. Get them to sign up, and promise to loan them the books if you win! Hey, that doubles your chances! If you or your friend would like to see an excerpt of my writing, I've included a snippet at the end of this post! Blane Roeper is in a world of hurt. A struggling new Christian with an alcohol-stained past, he returns home for his family’s forgiveness . . . and his childhood sweetheart. Instead, he finds his father dead, the family farm up for auction in ninety days, and his sweetheart set on marrying his brother. Besides closing the local saloon, Temperance activist Valor Hill has two goals in life. First, forget Blane Roeper ever existed. Second? Take in his orphan sister and rear the girl as her own. But to do that she needs a husband, so Valor pursues the last bachelor in town—Blane’s brother. When the brother is injured in a strange accident, the saloon owner’s veiled threats against Valor grow suspicious. Is the smooth-talking man also behind the other mishaps on the farm? Can Blane conquer old fears to save the homeplace and win back his lady in time? Or will he forever relinquish a heart of valor? For a sample of some of my writing, click here. Hi, Maxie! I'm so sorry you're having difficulty! I don't see you in the list, but if you'll email me at nataliedmonk (at) gmail (dot) com, I'll add you manually. Otherwise I don't have your email or anyway of contacting you about the giveaway if you won. Thank you so much for letting me know! Natalie, I hope that you get many subscribers and build that platform like crazy! I signed up but I do have to say that the next step was to confirm an email. I haven't seen one yet. So just in case there is a problem, I am going to give it to you now so you can manually add me if for some reason it didn't show up. Hi, Kelly!!! Thanks so much for letting me know!!! :) I'll go ahead and add you and enter you in the contest! Good luck in the giveaway! I might have misunderstood, has this book been released yet? I LOVE the concept. It's definitely something I'm interested in reading. What's the title and where can I buy it?? If it's still unpublished then I'll be counting the days until it's released. Good luck! Good luck with your list, Natalie. It's exciting/thrilling to watch it grow! Blessings in all your writing. Renee! Thanks so much for signing up!! We're up to 200 amazing subscribers, and I'm so proud to have you join us!!! Best wishes in the giveaway! Just signed up, Natalie. Hope your list just grows and grows. :) Thanks for the fun giveaway!